Another one of my 2016 discoveries is COCOLINE Naturals. Being pregnant during that time though had my hormones and senses going haywire so it’s only now that I get to do a proper review. 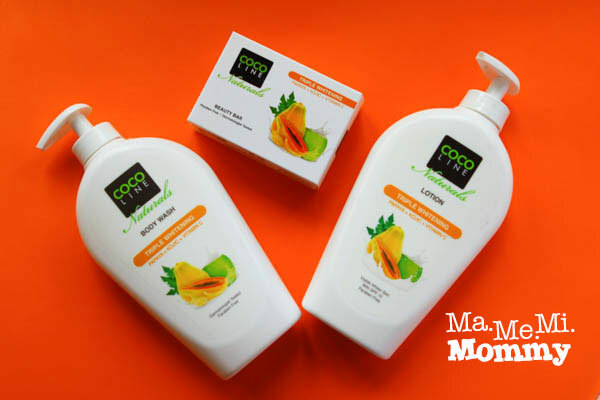 COCOLINE Naturals is all the goodness of Virgin Coconut Oil in a bottle. 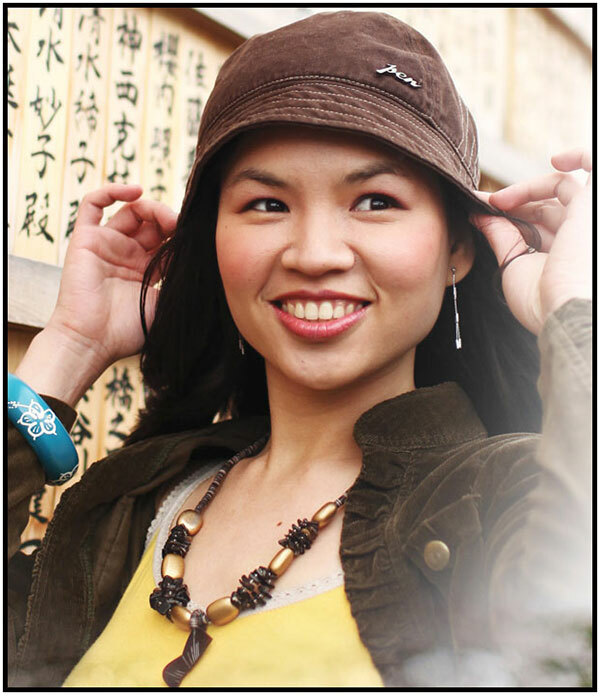 It’s all-natural, anti-fungal and anti-bacterial, and best of all, paraben-free. It comes in two variants, Intense Moisturizing and Triple Whitening. The body wash is in a translucent liquid and has a sweet almost flowery scent. 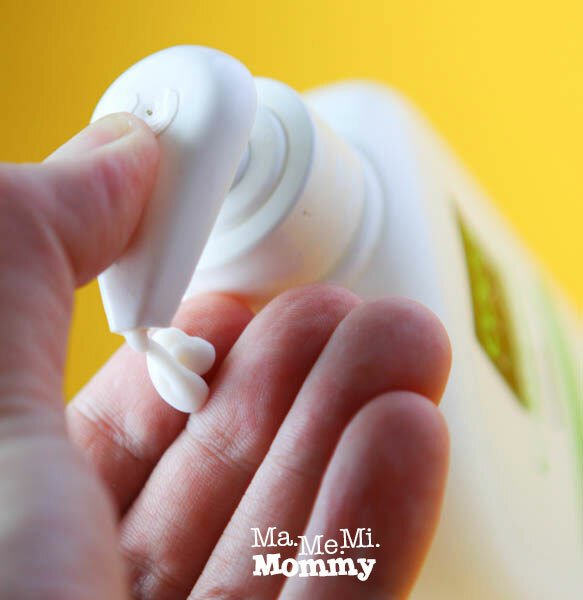 To be honest, I’m not a big fan of the smell and it was one of the morning sickness triggers during my pregnancy. Despite that, my bottle is almost used up because I have been using it on the kids everyday. I use it to wash their bums after every toilet break (when they do number 2). For the longest time, I have been looking for a gentle, moisturizing product for them as they always complain of ouchie bums after constant washing. Sure enough, when I check, their bums were all red and sore. I tried COCOLINE Naturals on them once and I have never looked back. It’s so hiyang with them and I have not heard any complaint since. I’m not complaining either, as I do believe in the power of the coconut. 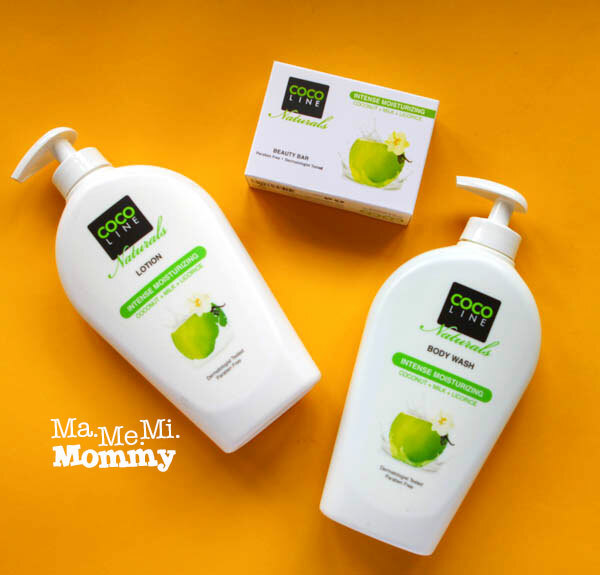 Knowing that COCOLINE Naturals are made from natural ingredients has given me the assurance that they’re safe even for my kids’ sensitive skin. The lotion is in the usual white creamy form and has the same scent as the body wash. I was surprised to see the sqaurish corners of this beauty bar. It does seem bigger compared to the usual soap in the market, which is definitely a good thing. 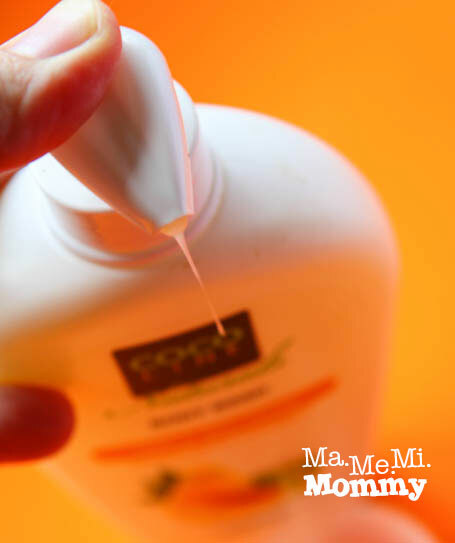 Compared to the intense moisturizing line, the liquid of this body wash is more watery, as can be seen in the photo. The scent however, is so much more to my liking! It has the signature papaya smell that is sure to be a pick-upper. I have yet to try the effectiveness of the whitening claim though as I’ve just started with it. I’m currently using it on some dark areas and hopefully, I’ll see some improvement soon. The lotion is also noticeably more watery than the other line. It bears the same lovely papaya scent as the body wash. The beauty looks the same as the previous one but this one comes in very bright orange. It smells just as good as the body wash and the lotion! COCOLINE Naturals products are available in SM Hypermarket, SM Supermarket, Landmark Supermarket, Shopwise, South Supermarket, Metro Supermarket, select Puregold outlets, Fishermall Supermarket, Sta. Lucia East Ph 3, Pioneer, Makati Supermarket, Unimart, Hi-Top, Tropical Hut, Gaisano, CSI; and select Watsons (inside SM malls only), select Mercury Drug Stores & 7-11 Stores; and other supermarkets and groceries nationwide. Wow!!! Thanks for this opportunity. 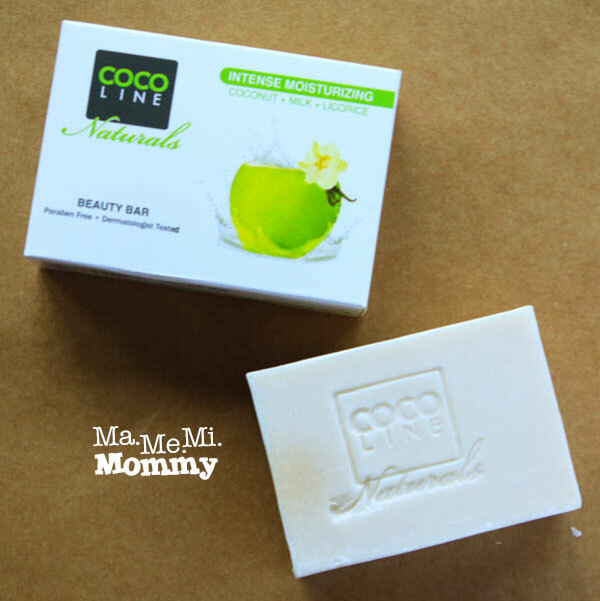 Hope to win pars marry ko iyong product from COCOLINE naturals.. I love to win it!!! Thank you po for the opportunity to join this awesome giveaway! Hi Ms.Cheryl thanks po sa review and sa opportunity na manalo ng Cocoline products I joined po in your giveaway and I would loved to win the triple whitening set because I really really need that one nung 1st pregnancy ko po kasi I had this na parang kati kati sa likod ko and when I gave birth npansin ko po na umitim siya at naging dark spots na siya pero as time goes by nawala.naman siya pero this time on my 2nd pregnancy meron ulit siya pero ngayon sobrang tagal niya ng matanggal kahit na madami na akong na try na products bars and lotion pero medyo madami pa din siya kaya medyo nahihiya na akong magsuot ng damit na kita ang likod ko dahil sa mga dark spots kaya sobrang gusto ko siyang itry at baka eto na ang solusyon sa problema ko heheh.. at gusto ko din po talaga na pumantay ang kulay ko at pumuti.Thank you po and Godbless More Power. Joining madam! Hope I can Try this awesome whitening products from yours and COCOLINE.thanks for the opportunity to join! May God bless you more Madame! Hoping to win this i would love to try the triple whitening product.thanks for this opportunity. I want to win the COCOLINE Intense Moisturizing Set. 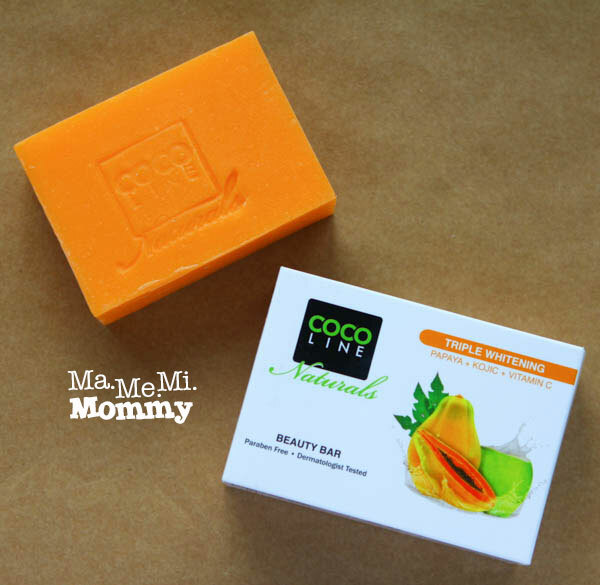 I want my skin to be moisturized with a natural products and COCOLINE will definitely make it possible. For sure this will fade my blemishes and make my skin extra soft and smooth skin. I am excited to use this and indulge with these skin salve soon! I want to win the COCOLINE Triple Whitening Set. I am a working mom and I travel via public transportation, this make me exposed to the sun, pollution, germs, and other factors that can harm my skin. COCOLINE Triple Whitening will surely aid my skin problems and will definitely give me a healthy glowing skin because it has anti-bacteria , anti-fungal, & anti-oxidant properties. It can also exfoliate dead skin and helps lighten stubborn dark-spots. I am looking forward to use this set for a healthy and glowing skin everyday! Hope to win sana po isa aqo sa palarin na mapili…..